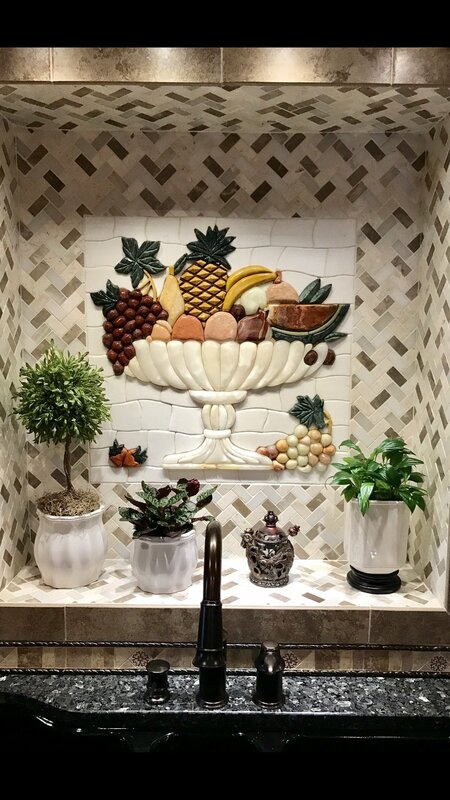 Pietre Mosaico (Stones Mosaic) illustrates an amazing fruit bowl mosaic kitchen backsplash to accent the decor in your kitchen. It is made of hand cut tiles and natural stone making it the perfect modest yet stylish piece to be used as a mosaic backsplash for your kitchen countertop. The bowl is three dimensional and the vibrant colors of the fruit provide a nice contrast to the muted tones of the rest of the artwork. Do you like to see how Mosaic Patterns- Pietre Mosaico looks on your wall? We are really impressed with the work and defiantly recommend this company. Although I have not installed it yet the piece is a fantastic work if art. It arrived almost intact. There are two small chips in the white background tiles. I think grout will cover it easily. It's beautiful and I can't wait to display it in my kitchen. Love this beautiful piece of fabulous Art work! Thank you Mozaico! Absolutely love this mosaic. We put it as a back splash behind the cooktop below the hood. It's spectacular. The only downside is that it was rolled up of course for shipping, but that made it almost impossible to completely flatten out as the fiberglass became quite rigid. After remodeling our kitchen ,it is one of the most beautiful items in our kitchen. Simply gorgeous!